Back in March 2013, Wales manager Chris Coleman told the world’s press that he would wrap Gareth Bale ‘in cotton wool’ ahead of an important international against Croatia. While this comment wasn’t to be taken literally, of course, there was a glimmer of truth in there somewhere. One of the best players in the world and almost certainly the finest to ever wear the famous red shirt, Bale had been battling a stomach bug at the time. Coleman knew that, in order for Wales to stand any chance of winning the game, the future Real Madrid Galactico simply had to be fit, healthy and available. In the end, he played, but his team didn’t win. Next week, Wales begin their qualification campaign for Euro 2016 with a visit to Andorra, and while this footballing minnow on the Spain/France border may not represent a particularly difficult opener, it is the pitch that is causing most concern. The controversial 3G surface is worrying many, not least Bale’s Real Madrid paymasters. In previous years, artificial pitches were held responsible for a number of injuries, many of them serious. Players falling onto a surface that was harder and less likely to absorb an impact were often sidelined for lengthy periods. Slide tackles became something of a gamble due to the inevitable friction burns which resulted. Gareth Bale’s risk of injury on Andorra’s 3G pitch is no greater than that of Aaron Ramsey, Joe Ledley or Ashley Williams, of course. In truth, however, a player that was bought for more than £85 million represents something of a massive gamble whenever he isn’t playing on a traditional grass pitch. You can understand Real Madrid’s reluctance to allow one of their stars to take a bigger risk than may be thought necessary. But in the same vein it is easy to see why Wales are desperate for him to play. The upcoming qualification campaign gives them a better chance of success than they have had for many years, thanks to a group that includes Belgium, Bosnia-Herzegovina, Israel, Cyprus and the Andorrans. With the top two going straight to France, Chris Coleman knows that his squad are capable of reaching their first major tournament since 1958. For this reason more than any other, you can expect Bale to don his kit, lace up his boots and hope for the best in Andorra. Modern 3G and 4G pitches are as state of the art as they get, and are the latest addition to an evolution that has been many years in the making. As the infographic from Compost Direct at the bottom of the article shows, football was played on pretty much the same surface as you would find in the local park until the 1960s came along. >> Find out more about the evolution of the football pitch. The first major stadium to adopt an artificial surface was Houston’s Astrodome in 1966. Football in the UK remained grass-based until the 1980s, when the likes of Luton Town, Queens Park Rangers, Preston North End and Oldham Athletic made the bold move to ‘go plastic’. Unfortunately, these new surfaces brought with them a number of drawbacks. To the casual spectator, the most obvious disadvantage was in the behaviour of the ball. If a hopeful punt from a goalkeeper wasn’t dealt with by the centre half, the bounce could lead to ball soaring more than thirty feet in the air. There were times when a match at Loftus Road or Deepdale might look more like a game of Super Mario. For players, managers and club directors, the main concern was the sudden rise in impact injuries and friction burns. Traditionally, defenders always loved to slide into a winger on a clammy, muddy surface. Whereas they would win the ball before, now they were rewarded with a thigh that looked more like a rasher of overcooked bacon. By the mid-1990s, artificial pitches were banned, and for manufacturers it was a case of going back to basics. In the early years of the 21st century, 3G and 4G surfaces started to gain popularity, and in recent times the likes of Arsenal, Manchester City and Tottenham Hotspur have embraced the new revolution. There are several advantages to the new pitches. They tend to need less maintenance and are generally extremely hard-wearing, important issues for the cost-conscious financial directors. Perhaps most crucially of all in the era of supe -stadia that contain several tiers, the surfaces aren’t dependent on hour after hour of natural sunlight. In the run-up to the Andorra v Wales match, FIFA inspectors came to the Estadi Comunal d'Andorra la Vella to see whether the pitch had their approval. 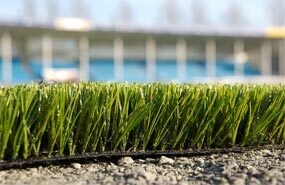 While the game’s governing body may have misgivings about this particular surface, the fact is that artificial pitches are, in some form or other, here to stay. Presumably, Manchester City will be just as concerned about the Andorra surface when Edin Dzeko plays there for his native Bosnia-Herzegovina, and the same applies to a number of top European clubs when Belgium will be the visitors. The likes of Eden Hazard, Vincent Kompany and Thomas Vermaelen will all be watched with a close eye from certain quarters. The modern game is far slicker and far faster than in previous decades, and this is another reason to love 3G and 4G pitches. If you like to see speedy interaction between players and lively passing to feet, you can’t expect the skill levels to be so high when teams are playing on an uneven quagmire. Overall, the adoption of semi-artificial pitches has to be a good thing, if only because none of us wants to go back to the bad old days of boring route one football. But with this acceptance there has to be a proviso that surfaces need to be no more likely to contribute to injuries than traditional grass pitches. For Bale, a run-out against the part-timers of Andorra may be a fairly straightforward affair, and will give him a chance to add to his international goal tally. For his bosses at Real Madrid, the chances are the focus will be on how quickly he manages to get up when he falls to the floor after a tackle. There are some who wonder whether Bale will continue to play as often for his country if artificial pitches become more common. This is surely an unlikely outcome for a player who has always been proud to wear the Welsh shirt. By the time the ref blows for full-time in Andorra, however, he, along with several people located in the Spanish capital, will be hoping to breathe a large sigh of relief.